Ahoy there and welcome to the Pirate Hideaway! 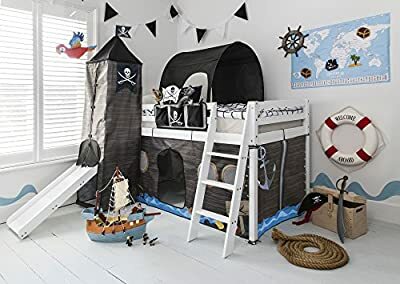 This exciting cabin bed is a paradise for mini pirates on the run. There's a watchtower where you can keep an eye out for enemy ships, a tunnel and den perfect for lying low when sailors come looking for you and even a sleeping spot to get some much-needed shuteye. Ay, the pirate life can be exhausting! If all else fails and you need to abandon ship, simply make a quick getaway down the handy slide. Crafted from solid pine, the cabin bed is safe and sturdy, making it the ultimate pirate hideaway.